♥ Domestic Rabbits - What are they and where did they come from? ♥ ARBA, Who are they and what do they do? A female rabbit is called a doe, a male rabbit is a buck. A male and female that have babies are generally referred to as a dam (female) and sire (male). Baby rabbits are called kits. Domestic Rabbits are very social animals, but they can form a lifetime attachment to another rabbit whether it be male or female. Generally the pairing is male to female, but we have had some female/female and male/male pairings at the rabbit rescue like the Boot Brothers in this picture. If you pair male to female, make sure your animals are spayed and neutered unless you want a lot of rabbits to take care of. If you want to breed your rabbits, you should not allow a male rabbit to breed until he is at least 6 months old, and a female can start breeding when she is 5 months, however, a male rabbit if left with a female will breed as early as 10 weeks of age. So, when you have young rabbits, make sure they are all kept separate after they have been weaned (at approximately 8 weeks old) or you will put your rabbits at risk and you may have unexpected babies. When you breed your rabbits, place the doe into the buck’s hutch or put them on neutral territory. Does are very defensive of their territory and may attach another rabbit in her own hutch. Unlike other mammals, does (female rabbits) do not “come into heat”. They produce eggs after copulating (mating) with a buck. This is called “induced ovulation”. Because of this trait, a doe can mate with a buck any time of the year. It can also create problems if a female is already pregnant and is mounted by a male. In this situation, the female will produce more eggs, which may end up growing in the fallopian tubes instead of the uterus. It takes approximately 28 to 32 days after becoming pregnant for the doe to have her babies. A group of babies (kits) are called a litter. Near the end of this time of gestation (approximately a day or two before having her babies), the doe (female) will strip hair from her breast, gather hay, and build a nest for her babies. This is called nesting. Note that even if your doe is not pregnant, she may still build nests. This is sometime referred to as “false pregnancy”, but don’t worry, it is normal. Make sure your doe has a “nesting box” in which to build her nest. A nesting box can be any box big enough for the female and some babies, enclosed to make her feel secure, with a hole to go in and out, and a raised lip at the hole to help keep the babies from crawling out too early. Make sure the openings in the does hutch (bars, holes etc.) are very small around the bottom of the hutch. Baby rabbits are about the size of a mouse and can escape from ordinary hutches. You can also use 1/8 or 1/4 inch screen around the bottom of the hutch to contain the babies. Keep your bunny in a quiet place and try to disturb her as little as possible. If a female feels threatened or unsecure, she will eat her babies. This is a primitive instinct in some mammals. When a doe has her babies, it is called “kindling”. Rabbits can have anywhere from 1 kit (baby) up to 10 depending on the size of your rabbit. The kits are born blind, deaf, and hairless and are totally dependent on their mothers care. They will hear, see, and be completely covered with hair in approximately 10 days. Unlike a cat or dog, the doe does not lay down to feed her kits. She will stand over them and the kits will roll onto their backs and suckle. A female will feed her babies 1 to 2 times per day, generally before sun up and after sun down. Also unlike a dog or cat, the doe will not spend a lot of time with her babies. She will remain at some distance from the nest and appear to be ignoring her young, however, this is a natural instinct. 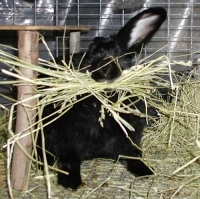 It is the rabbit’s instinct to not draw attention to the nest by occupying it with the kits. Though she may seem to be uncaring, she is keeping a very close eye on the nest and will defend it if anything disturbs her kits and/or attempt to draw a predator away from the nest if they get too close. Kits are weaned at 8 weeks old. Until then, it is important that the kits continue receiving their mother’s milk. Adult rabbits have special bacteria in their stomachs that aid them in digesting solid vegetables. Before the end of the 8 weeks, the mother’s milk begins producing this special bacterium for the kits. 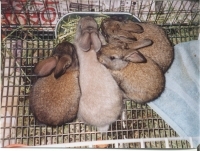 If weaned too early, the kits will not be able to properly digest “adult” rabbit food which could cause stomach, intestinal, and digestive problems causing the young rabbit to expire. These bunnies are approximately 3 months old. Domestic Rabbits - What are they and where did they come from? Domestic Rabbit is one of several breeds of European rabbits adapted to domestic or home life. The domestic rabbit originated from the Oryctolagus Cuniculuc (a type of lagomorph or rabbit) found in Europe and Africa. The word bunny is a term for a rabbit which was derived from the word “bun”, meaning tail. Bunny when applied to a rabbit means animal with a “little tail”. Alternate terms are rabbit, domestic rabbit, wild rabbit, cotton tail, jack rabbit, and lagomorph. Rabbits are often mistaken for rodents, but can be distinguished from rodents by the two sets of incisor teeth, one behind the other. Originally, in the middle ages, the rabbit was selectively bred as a farm animal for food and fur. In the 1800, people began to breed them for shows in America and Western Europe instead of strictly for their wool, fur, and food. People who breed rabbits for show are called Rabbit Fanciers. In the Victorian Period (between 1837 and 1901) people began breeding rabbits as pets. 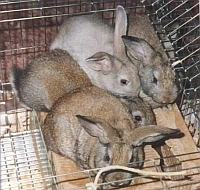 Rabbits are also still used today for laboratory testing as they have been for years. All breeds of rabbits in the United States today descended from European varieties of rabbits. There are currently 50 breeds of rabbit recognized by the ARBA when you count the most recent addition, the Lion Head. The current recognized breeds of Domestic Rabbit are, American, American Chinchilla, American Fuzzy Lop, American Sable, Angora, Belgian Hare, Beveren, Blanc De Hotot, Britannia Petite, Californian, Champagne D'argent, Checkered Giant, Cinnamon, Creme D'argent, Dutch, Dwarf Hotot, English Angora, English Lop, English Spot, Flemish Giant, Florida White, French Angora, French Lop, Giant Angora, Giant Chinchilla, Harlequin, Havana, Himalayan, Holland Lop, Jersey Wooly, Lilac, Mini Lop, Mini Rex, Mini Satin, Netherland Dwarf, New Zealand, Palomino, Polish, Rex, Rhinelander, Satin, Satin Angora, Silver, Silver Fox, Silver Marten, Standard Chinchilla, Tan, Thrianta, and the Lion Head. We'll have more on each breed later. ARBA, Who are they and what do they do? ARBA is the abbreviation for the American Rabbit Breeders Association. Organized around 1910 under the name of The Pet Stock Association, this organization is dedicated to the development, promotion, and improvement of domestic rabbits and cavies (Guinea Pigs). Originally geared towards the development of commercial rabbits (rabbits for food and fur), over the years, they eventually adopted the name American Rabbit Breeders Association and moved their focus towards exhibition and pet rabbits and cavies. They set the standards for developing good rabbits including color, weight, physical build, and physical characteristics. They have hundreds of trained professional judges across the United States that judge the many sanctioned shows year round. 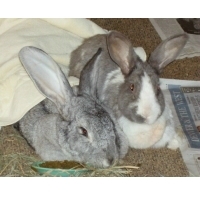 You can read about the rabbit standards, colors, and approved ARBA breeds on their web site at www.arba.net. You can also check out the scheduled show dates and registered breeders on their web site. They have over 24,000 members across the United States, Canada, and overseas. Their members include individual pet owners as well as breeders.